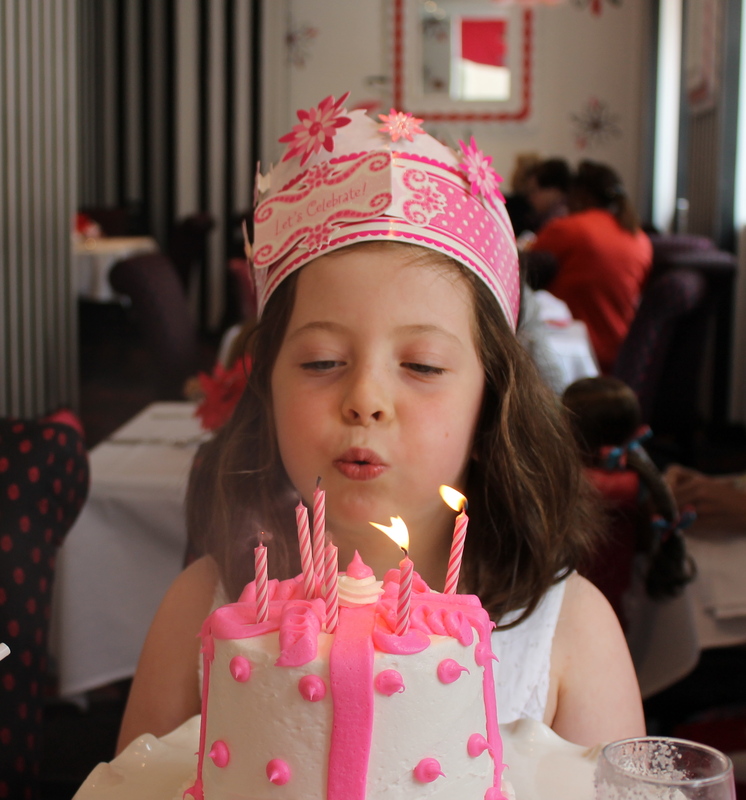 To celebrate L’s 6th birthday, her grandmother decided to treat the family to lunch at the American Girl Café. 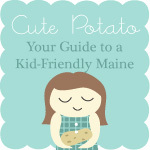 If you have a little one over five, you can imagine the excitement surrounding this visit. However, I was apprehensive. Would the store be a tourist trap, and would a birthday celebration be worth the expense? One look at my daughter’s face when we arrived, I knew grandma made the right choice. 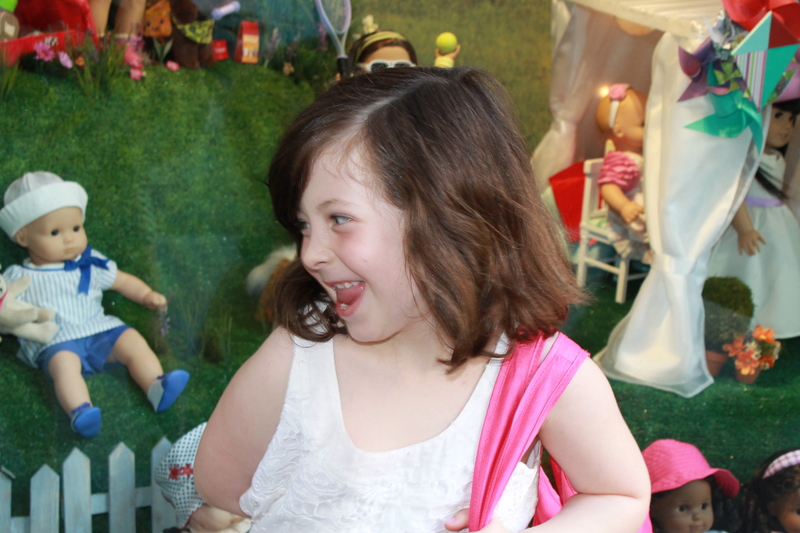 Outside American Girl Doll Place. L’s enthusiasm is contagious. 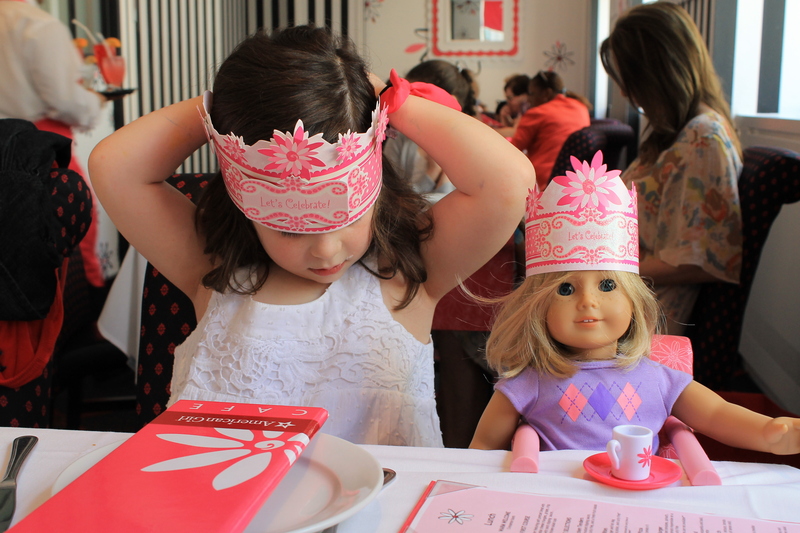 Like Disney, it’s hard not to feel like a kid again at American Girl Place. There are unique dolls, clothing, and cute accessories everywhere you look. 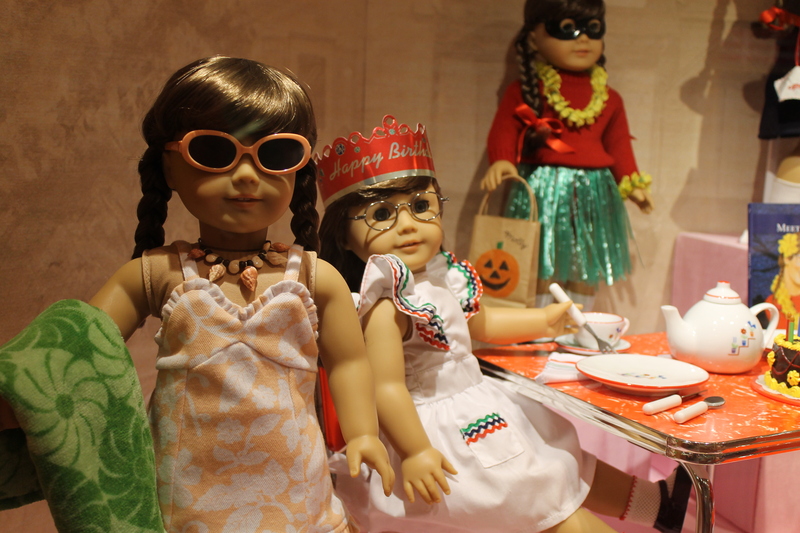 On the second floor, we discovered a department featuring dolls from different eras, as well as McKenna, the 2012 American Girl Doll of the year. There’s also a section for shoes, which my daughter loved (hmm… I wonder who she takes after), plus a hair salon, sweet shop, and doll hospital. L. discovers the shoe section. We could have continued shopping, but it was time for L’s birthday lunch. 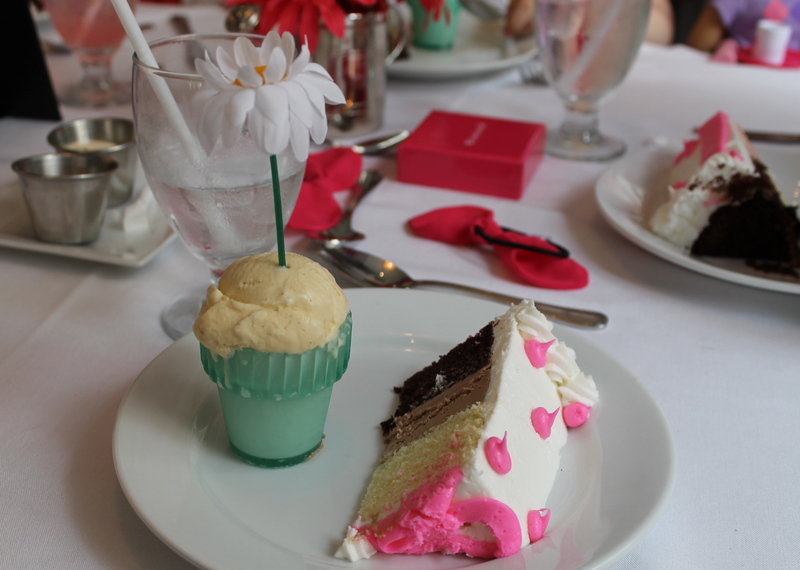 The third floor café looks like something out of Eloise. The striped wallpaper is black and white, and the accents in the room are bright pink. After a short wait, we were escorted to our table and L’s doll, Kit, was given a special chair. Once we were seated, the waitress delivered warm cinnamon rolls and a drink menu. 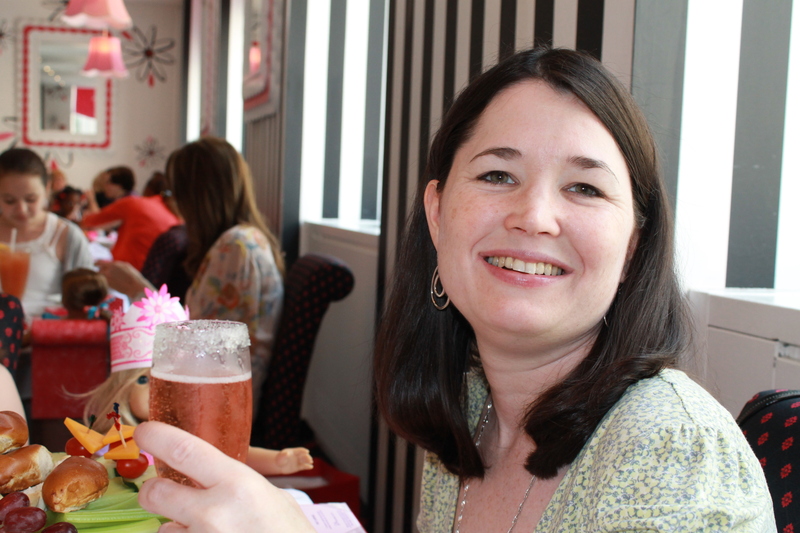 L. ordered pink lemonade, and the adults indulged in peach Bellinis and strawberry Cosmos. L. adjusts her birthday crown with Kit at her side. Aunt C. toasts her niece (and shows off her drink). Lunch was surprisingly good. L. chose a plain cheese pizza, but the rest of us enjoyed generous salads and sandwiches. Dessert was the most exciting part of our meal. L. was thrilled when the waitress presented her with a beautiful little birthday cake and ice cream. 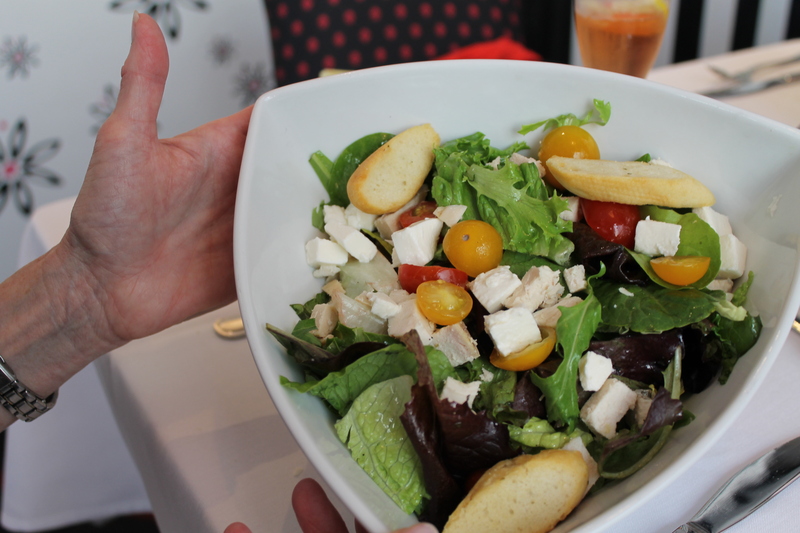 A simple salad with grilled chicken, cherry tomatoes, and feta cheese. 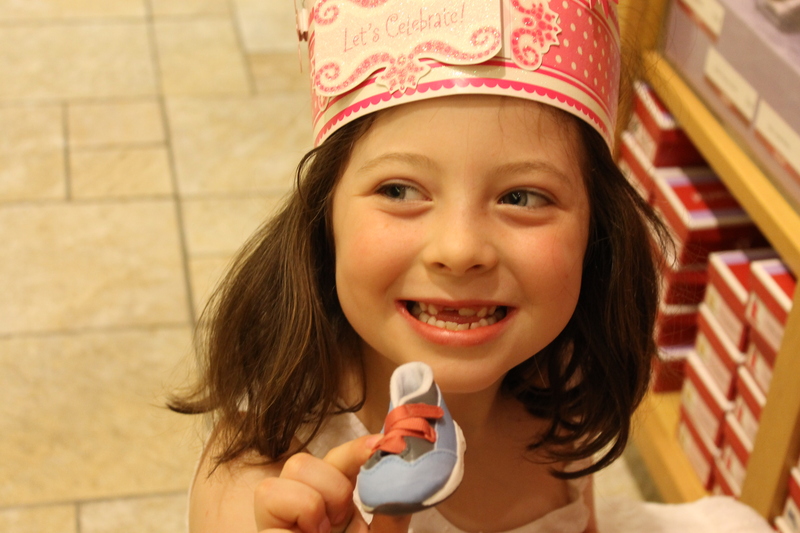 The whole experience, from shopping American Girl Place to the delicious cafe lunch, was a treat for us all. Thank you, grandma!